UPDATED: Tue., March 13, 2018, 10:14 p.m. The Big Sky Conference was represented by seven student-athletes on the Eastern Washington senior forward Bogdan Bliznyk was named to the National Association of Basketball Coaches (NABC) All-District 6 Team on Tuesday. The Big Sky’s all-time leading scorer (2,142 points) and the 2017-18 Most Valuable Player, Bliznyuk was the lone player to rank in the top five in the league in scoring, rebounding and assists during conference play. OREM, Utah – The Eastern Washington men’s basketball team’s season came to an end Tuesday night, and Eagles coach Shantay Legans could easily have focused on the number 20 after an 87-65 loss at Utah Valley in the first round of the College Basketball Invitational. 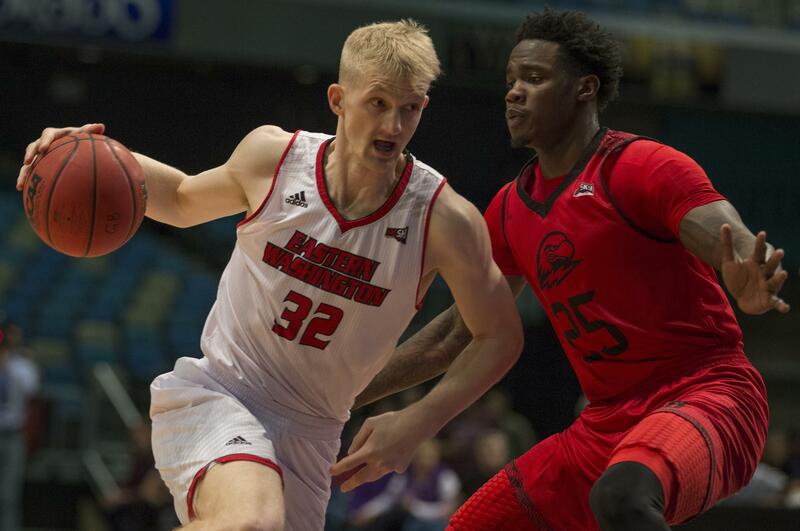 Twenty, as in 20 wins in his first year as the EWU head coach, or maybe 20 minutes away from an NCAA Tournament bid before faltering in the second half of the Big Sky Tournament championship game last Saturday. But that wasn’t the message Legans had for his players. “A lot of people will pat you on the back for 20 wins, pat you on the back for getting to the championship,” Legans said. “But that’s how losers think. We want to get to the championship. We want to win league championships. Eastern Washington, which finished 20-15, played in the first game of the CBI. The rest of the 16-team field begins Wednesday. For the Eagles, the game against the Wolverines got away at the midway portion of the first half. With the score 13-10 in favor of the visitors, Utah Valley scored nine consecutive points. The closest Eastern Washington came after was three points on a couple of occasions before halftime. In the first half, the Eagles shot 11 of 30 from the field, which included 2 for 10 on 3-pointers. The second half didn’t help EWU’s cause. The Eagles finished 25 of 70 from the floor, including 18 percent from long-range. “It was our worst shooting night,” Legans said. “I don’t think we stepped up to the plate tonight and played with passion tonight. It’s hard and they went through the same thing (in the Big Sky title game). Twenty minutes away from going to the NCAA Tournament. EWU trailed 36-29 at halftime and fell behind by 15 points less than 7 minutes into the second half. Eastern Washington’s last run at the Wolverines was eight consecutive points – with a 3-pointer from Sir Washington and baskets by Bogdan Bliznyuk and Jacob Davison as part of the mix – to make the score 53-46. But Utah Valley immediately answered with a 9-0 run. Utah Valley (23-10), which shot 55 percent from the floor and hit 22 of its 26 free-throw tries, was paced by 7-footer Akolda Manyang’s 20 points. Bliznyuk, the Big Sky Player of the Year, scored 27 points to break the school’s single-season record with 741 points. Tyler Harvey scored 738 points three seasons ago. Bliznyuk also holds the conference’s career scoring mark with 2,169 points. Ty Gibson added eight points for the Eagles while Davison, a promising freshman, tallied seven. “It was kind of sinking in,” said Bliznyuk of the last moments of his collegiate playing days. “I’m kind of sad that it’s all over, but I’m happy about how things went in my career. Published: March 13, 2018, 9:44 p.m. Updated: March 13, 2018, 10:14 p.m.